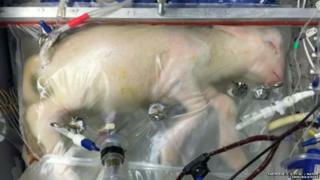 Scientists have been able to keep premature lambs alive for weeks using an artificial womb that looks like a plastic bag. The Children's Hospital of Philadelphia team insists it is not looking to replace mothers or extend the limits of viability - merely to find a better way to support babies who are born too early. The plastic "biobag" womb contains a mixture of warm water and added salts, similar to amniotic fluid, to support and protect the foetus. The baby lamb's heart does all the pumping work, sending "old, used" blood out to the machine to be replenished before it returns back to the body again. Researcher Dr Emily Partridge explained: "The challenging age that we are trying to offset is that 23- to 24-week baby who is faced with such a challenge of adapting to life outside of the uterus on dry land, breathing air when they are not supposed to be there yet." "They appear to have normal development in all respects," said lead investigator Dr Alan Flake. Even if the work can progress, it's not clear how parents-to-be might feel about it. Fellow researcher Dr Marcus Davey said: "We envisage the unit will look pretty much like a traditional incubator. It will have a lid and inside that warmed environment would be the baby inside the biobag." Prof Colin Duncan, professor of reproductive medicine and science at the University of Edinburgh, said: "This study is a very important step forward. There are still huge challenges to refine the technique, to make good results more consistent and eventually to compare outcomes with current neonatal intensive care strategies. "This will require a lot of additional pre-clinical research and development and this treatment will not enter the clinic any time soon." Video One in ten new born babies comes to a neonatal unit.